Neon promotional items are so fitting for summer. You see bright hues everywhere: apparel, beach towels, nail polish. It only makes sense that promo items follow the neon trend. Neon is, after all, the unofficial color of the season. For marketers, fluorescent promos are just the way to go bold and bright – and get their brands noticed. This is especially true if you’re marketing to summer travelers. Two-thirds (66%) of U.S. adults plan to take a leisure trip this summer, according to a new AAA survey. These travelers will hit the road a few times, averaging 3.5 trips during the summer months. Your brand should go along on these getaways. Think about what travelers need when they’re setting off for a new destination. A great bag for toting to the pool or beach? A handy luggage tag for easily spotting their gear? How about some summer must-haves – sunglasses, sunscreen, or lip balm? Now, take these promos up a notch – get them in the neon shades of summer. 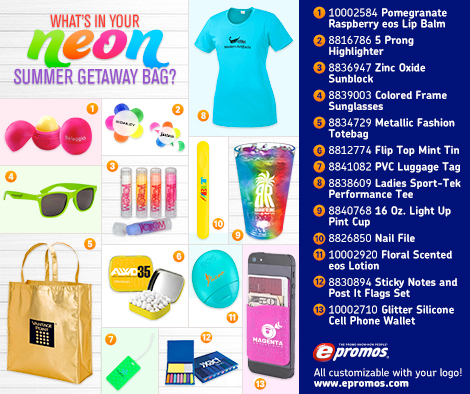 We’ve put together an infographic with 13 neon promotional products to supercharge your promos this summer. Take a look and share!